Superman: Earth One, vol. 1 by J. Michael Straczynski (writer) and Shane Davis, Sandra Hope (artists) is a reboot of the famous superhero. Earth One is a comic even by DC which retells the earlier adventures of some of its characters. Superman: Earth One, vol. 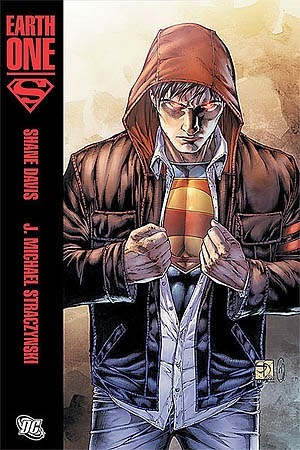 1 by J. Michael Straczynski (writer) and Shane Davis, Sandra Hope (artists) is a book meant to introduce Superman to a whole generation of people who, frankly, don’t give a Kryptonine fart about the Man of Steel. The story and artwork are clearly marketed for teenagers, but that doesn’t mean the book isn’t good. I enjoyed the story, it was, for me, a quick read even though I have read many Superman origin stories. Even though the story attempts to reboot the franchise and, admiringly, was published to get it out of the way, doesn’t mean it doesn’t have merit. I truly enjoyed the part of the story where Clark Kent, as a young man, is searching for something interesting to do when he grows up. Sound easy, right? After all, he can do anything, dance, sing, lead a football team. He could probably win the World Cup all by himself. But is that who he wants to be? The secret of the successful Superman storylines is that they focus more on the “man” and less on the “super”. This graphic novel takes a completely different approach and focuses on the environment which forces farm-boy Clark Kent to become an iconic superhero. The secret to any successful superhero story is, of course, the villain. A good villain can create a great hero from a mediocre, third rate, super powered, accident-of-science. However, a boring villain will take a phenomenal hero and drag him down to the bottom of Metropolis Harbor. The villain of this book, Tyrell, is unfortunately of the second type. The art is OK, some of the panels looked like they were photo-traced, and some are really good but should certainly be taken up a notch for future books. I’m also used to seen Superman as a person in his late 20’s or early 30’s, seeing him barely out of his teens was strange and somewhat discomforting. Overall, however, this was not a bad graphic novel, and I have to give a big nod to DC for taking a chance and trying to liven up their flagship character. I’m just not sure I like the “trendy” feel of the book.